Cantina de Frida is Belgrade's headliner in South American cuisine. Truth be told, it’s not like there is much competition, but Bojan Avramović, their head chef gave us some insight as to why Frida leads local gastronomy beyond borders. Tell us, how did you become a chef? That is the most basic question, but who knows when they are in high school that they want to be a cook? Practically nobody. My mother and grandmother were both amazing cooks, and when I was young I saw it as a sort of game. I would make burgers out of mud while my peers were kicking a ball around. So I decided to enroll in catering school, but my grades were not the best. So I started to work in a fast food joint, flipping burgers. And honestly I learned a lot. Much more than I did at school. Since then, my career started growing. So you’re not a fan of the catering school here? I believe that to be a great chef, you have to be a great teacher, psychologist and administrator. Talent, hard work and dedication are secondary. There is no other way to learn this but on the job. The catering school in Belgrade doesn’t manage to deliver in these fields, so a lot of us chefs find ourselves teaching catering school graduates from scratch. The best way to learn is on the job, but there is a lot more that goes into the work than just cooking. What makes Frida a unique gastronomic experience? In a country where a steak with grilled vegetables was the height of gastronomy up to a few years ago, Frida brought new tastes, spices and ingredients that most local chefs never worked with before. When I first started working in Frida, back in 2010, I encountered cumin for the first time. Frida represents fresh, rustic Latin American cuisine, influenced by Argentinian, Bolivian, Peruvian, Mexican and Spanish roots. We were the first to present dishes on wooden planks and rustic tapas plates, while others were going more in the direction of fine dining, which I personally am not a fan of. Our focus is to create dishes full of colour and flavour, that paired with the rustic presentation, create a familiar ambient. Frida Kahlo, the Mexican painter whom we draw inspiration from, was was a cook herself that also believed in the social aspect of the kitchen and how food brings people together. What does the process of creating the menu look like? As I already mentioned, administration is a large part of being a head chef. A lot of the planning depends on current trends. We have found that we have to adapt seasonally, adding more vegetarian and vegan options to satisfy the current trend. Last summer season we noticed that we were having a lot of guests from Turkey, so we adapted accordingly, adding more options without pork. The biggest satisfaction is when our guests are happy with their meal, so that's where we start in terms of planning. Any challenges preparing Latin American cuisine in the Balkans? A lot of Latin American ingredients are unavailable in Serbia, so we adapt the ones we do have access to as best we can. It is very important to us to serve authentic dishes, but also that they don’t cost an arm and a leg. We want to take our guests to Peru for 700 dinars. A good example of this is Salutables Tapas, a dish we created with carrots, almonds, goat cheese and ginger. It tastes so fresh and authentic, yet all the ingredients are local! What ingredient to you enjoy working with most? This is a very complex question. With three ingredients I can make anything, but one… I think it might be the carrot. We made the spring tapas with it, but in the winter I pair it with cinnamon, anise and ginger to make a warm winter carrot cake. You have to try the cake when there is snow on the ground, it really takes you back to a childhood Christmas. Yet the same ingredient in the spring has an entirely different context! 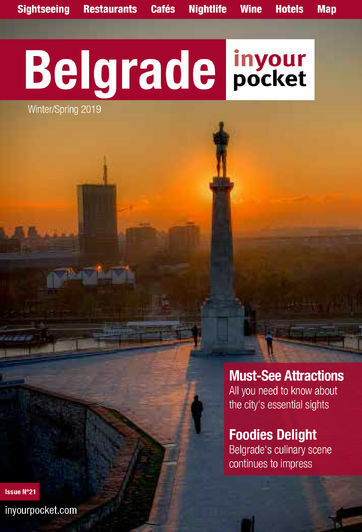 What is your favourite place to eat in Belgrade? When people ask me that, I’m only half joking when I say the fast food joint. When I finish with work, I don’t get to eat the food I made, so I go for a burger. Out of the Beton Hala venues, Sakura is especially good. I do like national food, but only if its very good quality. Basically if there is a spit, I'm happy!